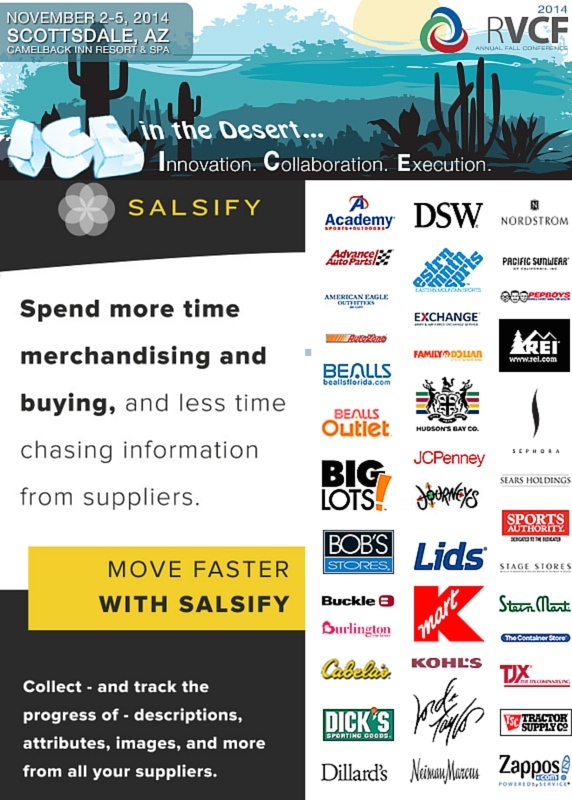 The Retail Value Chain Federation's (RCVF) annual conference is next week in Scottsdale, AZ, and Salsify will be there. Playing 18-holes in 75-degree weather is a a great reason to attend, especially as fall is in full swing (pun intended) here in Boston. More importantly, the conference will bring merchandise suppliers and retailers together to improve collaboration. There's a lot to look forward to at the conference, and so much to take in and learn. Let's take a look at the six things that we're most excited about. Yes, we're excited about the whole thing, and we're not ashamed to admit it! RVCF is all about improving collaboration between suppliers and retailers. That's their mission and that's our mission too (at least with respect to product information). This is a great setting for us to learn about how they work with each other. This session will talk about the steps brands are taking in order to deliver expanded product attributes and images. Expanded attributes, or extended attributes, is becoming a big topic in commerce and is already a friction point the supplier/retailer relationship. This session will provide a first hand look into how brands are facing the challenge. This session is a first-hand experience of a major retailer trying to align all its back-end processes and technology for omni-channel retail. An overwhelming challenge, and attendees are sure to get an “in the trenches” view of how to make it happen. Dillard's is one of the retailers that will begin to require extended attributes from their suppliers (along with Macy's and Nordstrom). We're really excited about this session because they see quality product information being a major driver in key retail priorities such as accelerating speed-to-market and decreasing chargebacks. Even the session description admits there is “endless discussion about omni-channel,” but this talk promises focus on key requirements that suppliers and retailers must do together in order meet omni-channel demands. It will refreshing to hear actionable guidance on how suppliers and retailers should be collaborating. Once again, omnichannel is played out, but it has placed a pressure on supplier/retailer collaboration. RVCF, APEX Analytix, Compliance Networks and Retail Solutions Inc. have imagined the next generation vendor portal. This might be a little tech-y, but should give an interesting forward-thinking view into vendor portal needs of retailers. While Salsify currently enables seamless item onboarding, we know this is only part of the equation and we're looking forward to getting a learning more about the other pieces of the puzzle. GS1 is the group that is leading the charge in creating standards for industry-specific attribute guidelines. This meeting will deep dive into sporting goods. We're hopeful that in this session we'll see how the sausage is made, and this is great not only because of its significant impact on e-commerce, but also we just really like sausage. Free Whitepaper: Why Product Content is The Secret Ingredient When Selling Through E-commerce Channels.